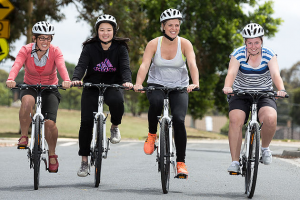 Cycling Victoria will encourage more women to hop on their bike with a Festival of Women’s Cycling in March in Melbourne and regional Victoria. A range of women’s riding events will be held over the weekend of March 25 & 26 empowering women to try different types of cycling and listen to talks and take part in social or competitive rides. Participation opportunities will cover all aspects of cycling including cyclocross, track, mountain biking, BMX, road and trail riding to name a few. Many events are family friendly and, of course, men are welcome too! Cycling is progressing at an unexpected rate in Victoria where adult and junior participation has grown, but participation among women in cycling is still roughly only 20 percent in the state according to Festival Director and Riding & People Manager at Cycling Victoria, Mark Drehlich. “This is concerning to us because there are so many benefits from cycling for women and families, yet research is showing that real and perceived barriers exist that are stopping women from jumping on a bike,” said Mark. “Female cyclists – beginner, advanced or anywhere in-between – enjoy access to a broad range of cycling types and hopping on a bike doesn’t mean lycra or competitive events, if that’s not what you’re into. “There are so many options whether you’re looking for transport, fun or fitness – you can hit the dirt on a BMX bike, find one of Melbourne’s hidden trail rides, take your vintage bike to the markets along bike paths and bike lanes or take part in one of our Social Spin sessions on a supplied stationary bike in a Melbourne park. In metro Melbourne, events include a ‘Come & try track cycling’ session at Harrison Street Veledrome and a breakfast and casual ride starting at Roberts Reserve in Brunswick. To find out more information about the Festival and local events happening near you, please visit http://thewomensride.com.au/.